Tuesday, August 18th: After a whirlwind day on Monday, Shloime deserved a little bit of a chance to breathe. That doesn’t mean to say he got a chance to relax: a phone interview with Dos Music, followed by another with Shlager. After that it was off to Greentec’s Yerushalyim location where he met with the workers and had a short interview with hareidim.co.il. Finally, Shloime topped his day with a small kumzitz on a Tel Aviv beach with Dudi Kalish. After that it was time to rest up for Wednesday’s big concert at Binyanei Hauma. Wednesday, August 19:The big day!! Shloime spent his morning in rehearsals where he had the opportunity to get to know a few of Israel’s best singers, who were equally happy to get to meet this rising American star! Approximately one thousand people came to Binyanei Hauma for a star studded concert, headlined by none other than Shloime. Other performers included Mendy Jeruffi, Itzik Eishel and Itzik Orlev, among many others. A few of the songs were featured live on both Israeli radio and online. And in case that wasn’t enough, Shloime also did another heartfelt kumzitz with Dudi Kalish at Kever Dovid. Over two hundred bochurim currently learning in Eretz Yisroel came to sing and be inspired. Thursday, August 20: Another visit to Greentec, this time at their Bnei Brak location. From there, Shloime went to do a radio interview with the Sefardi radio station, Radio Kol Beramah. It’s funny how Shloime’s music seems to touch people from all different walks of life. So many people commented that now that they’ve met Shloime, his music means even more to them. 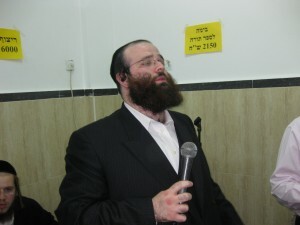 After that is was off to a Chanukas HaBayis at a Beis Medrash in Yerushalayim, where Shloime’s beautiful voice only enhanced the simcha of this momentous occasion. Friday, August 21: Even Shloime needs a day to relax. After recording a podcast for ShlageRadio, Shloime travels to Bnei Brak, looking forward to a beautiful, inspiring Shabbos! Shabbos Kodesh, August 22: Is there anything more meaningful than Shabbos in Bnei Brak? I’m sure the people in Bnei Brak were as inspired by Shloime as he was by them. Despite the late hour, Shloime managed to squeeze in another interview on Motzei Shabbos, this one with Radio Kol Chai. Sunday, August 23: Shloime’s last full day in Eretz Yisroel started off when someone approached him after Shachris, saying they only wished that he had been the Ba’al Tefilla who davened Hallel on Rosh Chodesh. More interviews today and these were huge. The first was with Arutz Sheva, the Israeli national news network, which included recording a short music video. The second was with Radio Kol Yisrael, Israel’s biggest radio station. Hard to believe that in one short week Shloime covered just about every single major Israeli media outlet. Before heading to the airport, Shloime managed to fit in supper with Avi from Greentec. August 24: Back to the USA at dawn. Welcome back, Shloime. We can’t wait to see what’s coming next!